Just felt like posting this. It's a song I made on my PlayStation 2, if you can believe it, using MTV Music Generator 2. I had to review the application (it wasn't a game, it was an app) for a web site I worked at back then, so I decided I'd see what sort of song I could make with it. The beginning is kind of a joke, and I had no idea what I was doing, but you gotta admit, that's a pretty funky beat I put together. By the end, I was actually getting somewhat serious. I actually really like the second half of the song! 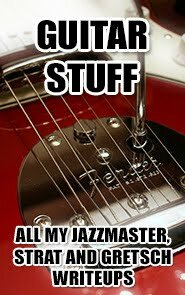 btw, I had an idea that I was going to take "dave bowman" as a stage name. Nobody else had that name at that time - not sure if that's still true now - and I thought the reference was both obscure enough and cool enough to work. Like about 10 million other Americans, I'm busy playing through Grand Theft Auto IV right now. In most ways, I'm no different than any of them - and I'm sure that if you're at all interested in this game, you've already seen plenty of user reviews, other blog entries and whatever else around the net. But dammit, I've got something to say and I'm gonna say it. My perspective is at least a little bit unique in that I worked in the industry for a while (on both the publishing and editorial sides) and I still live in New York - well, a mile outside it, anyway. A lot of people have asked me what I think about the game for those reasons - mostly my real-life friends, though some of them read this blog too. So here's what I think about GTA4: It's a fun, addictive, sometimes really smart, sometimes not so much, incredibly detailed, incredibly immersive game with annoying controls, some cheap missions and some really bad writing and acting. In other words, pretty much like every other recent GTA game, just taken to another level. I don't think it's a revolution. I do think it's "art", but then so was San Andreas, so was Vice City, so was GTA3. There's nothing in particular about GTA4 that's all that different from those games. I will say this right at the start: GTA4 is not a perfect 10, and it in no way deserves some of the insane scores it's received from reviewers that I once considered competent, if largely ineffectual. Gamespot, for its part, rated the game a 9.5 before mysteriously changing their score to a 10 some time later. They blamed the early score on a "bug" in their system that apparently changes all scores of "10" to "9.5" but affects no other part of the site. IGN obviously gave the game a 10.0, no doubt as a reward for being granted "exclusivity" on the first review. Let me tell you, folks, Rockstar plays hardball with reviewers. There's nothing new or particularly surprising there; what is surprising is just how easily reviewers in this industry cave to pressure, just how quick they are to sell out their editorial standards. I've largely stopped reading mainstream review sites for this reason (in fact, I haven't actually read IGN's or Gamespot's reviews - I just know the scores, and that was enough to convince me that the reviews were not worth reading). It is a sad state of affairs, despite all this talk recently about game "journalism" coming of age. I guess the industry collectively won't think it's really arrived until it goes through its first major payola scandal. Anyway, GTA4 is a flawed but still great game. The best thing about it is obviously the living world. I was describing it to one of my co-workers the other day and I was specifically telling him about how you could literally sit in your apartment in the game and watch TV all day if you wanted to - there are quite a few channels with originally-produced TV shows, some of which are really funny - and his response was "this sounds like the real Second Life". That was even before I told him about all of the online modes, so he wasn't even talking about interacting with other people, he was talking about an immersive parallel world that really mimics and distorts our own. And that's the thing GTAIV does better than probably any other game, ever. Liberty City has always been New York's alter ego, going back to the first Grand Theft Auto on PC (which I still have). Over the years and through various releases, it's gotten closer and closer to the city on which it's based - it is Rockstar Games' home, after all. Lots of people are talking about how accurate or inaccurate the version in GTAIV is. One guy has posted a pretty cool Flickr photo set showing comparisons between various in-game locations and their real life counterparts. What he missed, though, and what makes the game so impressive to me as a New Yorker, are all the lesser-known landmarks and neighborhoods that have been faithfully recreated in the game and that give both the real-life city and the in-game city a sense of uniqueness and wholeness. For example, Flushing Meadows Park is there, complete with all its old World's Fair constructions - the globe, the map, the towers. Much of Astoria, Queens is pretty faithfully rendered - 31st St. under the N line (I believe it's called the K line in the game) is easily recognizable. In fact, the beer garden in the game is modeled after the Bohemian Hall and Beer Garden in Astoria, and it looks very similar - oddly enough, the last time I went there myself was with Rockstar's former lead web designer. Anybody can create a city that's just filled with famous landmarks. The Empire State Building, the Statue of Liberty, Times Square... sure, these are part of New York. But they're not New York. GTA4 succeeds as a living world because it really gets to the heart of what makes the city breathe. It recreates neighborhoods, the lifeblood of any city. There's not nearly enough traffic, though this is obviously a gameplay decision to make driving easier. (For the record, this is what New York traffic really looks like.) The lack of parked cars is pretty distracting, though - how cool would it have been to have an endless lineup of parked cars to choose to jack? The absence of other cars really makes the city feel pretty dead compared to the real New York. Everybody moves too damn slow. Cars and pedestrians. Niko too. This hasn't changed since GTA3. It feels like a city of zombies, and like you're controlling a zombie. And not 28 Days Later zombies, more like George Romero zombies. The streets are empty by 11PM! You can wander through the real East Village at 3AM on a weeknight and it may as well be rush hour. Not so in the game. Liberty City is a city that sleeps. Car spawning still has the same issues as previous games. For one, whatever car you're driving will always be the most popular in the area you're driving it. For another, cars spawn in packs - crossing a bridge, for example, there will always be the same two bunches of cars about halfway across the span, then near the end. Oh, and nobody drives lifted pickup trucks in New York City. This isn't Idaho. It's a lot smaller than New York, even accounting for what's actually modeled. 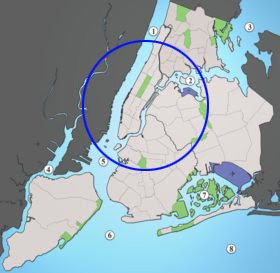 It's amazingly large for a game, but the real New York is hundreds of square miles in area and takes a good half an hour to cross by car on the highway. Liberty City is still compressed. I'd say pretty much everything is about 1/4 size, even within the areas that are modeled. Let me put it this way. In real life, I live just beyond JFK airport - the equivalent of being right off the edge of the map in Liberty City. I pretty often drive from where I live across Manhattan and into New Jersey. The total trip (not as the crow flies, but in road miles) is about 40 miles. It takes about an hour to make that trip. That's the equivalent of going from one edge of the Liberty City map to the other. In the game, you can do it in five minutes. Flying by helicopter from one side of the real New York to the other takes about 10 minutes - I've seen it on the local news in real time. Doing the same in Liberty City takes about 30 seconds. But the world in the game is not just the city itself. The radio stations, the in-game TV, and now the in-game internet all do their part in making things feel a little more alive than they otherwise would. It definitely does feel like there's a lot going on around you. 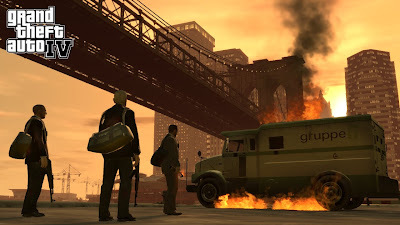 One new touch that I'm enjoying in GTA4 is hearing about my more major criminal exploits as "breaking news" on the radio, and reading about them in the Liberty Tree - the local newspaper - online. In fact, the game's a lot more political than previous GTA games have been. You know, GTA has always been satire, but it's a lot more overt this time around. That comes through most in the in-game media. "Weazel News", the Fox News parody, reports "the right news", focusing on crime and terrorism. WKTT talk radio promises that conservatives "finally have a real voice on the radio", including such pearls of wisdom as "science is good when it teaches us things like how to turn a million ungrateful foreigners into glass." It's actually SNL cast member Jason Sudeikis delivering that line, appearing alongside his SNL colleague Bill Hader (on PLR, the public radio station), who rails against the horrors of universal health care and asks anyone with a hip fracture to simply "end it all" and "not burden society" with their issues. The fact that the game is smarter than any of its contemporaries is part of the reason why I've never had a real problem with the violence - in fact, one of the ways I decompress after playing the game for a while is to save, then just go on a rampage of destruction and murder, seeing how many stars I can rack up and how many different creative ways I can find for killing cops and pedestrians (and getting away unscathed). The violence is so over the top as to be completely unrealistic for the most part, although I will say that graphics are now progressing to the point where I do occasionally feel bad about what I'm doing. There are also certain missions that are "ripped from the headlines", such as one that involves a botched bank robbery that mirrors this notorious 1997 Los Angeles bank heist, in which 16 people were wounded and the two suspects killed after thousands of rounds had been fired into the city streets. That blurring of fantasy and reality and the exploitation of real-world tragedy for fun I can't imagine being a good thing (it's one step away from a mission involving flying planes into buildings, for one thing), and I've always felt that it was never an issue in past GTA games. But it's starting to be one, as realistic as this series is now getting. Things I'm not particularly happy with include the music soundtrack, which is just lame compared to Vice City's (San Andreas' was too - guess VC left a tough collection to live up to), a lot of the acting, and the increasingly narcissistic writing that rings like a poor-man's Quentin Tarantino more and more with every passing release. As the missions progress, the cut-scenes introducing them become longer and longer for no good reason, featuring one-dimensional characters that all start out as assholes and actually become less likable as the game goes on. There is little actual story development; Niko's in Liberty City to look for an old army buddy that betrayed him, and along the way he meets various random people, some of whom he befriends, some of whom he befriends and kills, almost none of which have anything to do with anything. Rockstar really needs to get some professional writers in here, especially if they want (and they do want) their games to be considered in the same breadth as the best films. Even most first-time screenwriters have had some basic training in how to craft a good story. Go hire some kid just out of NYU or something. I'm almost finished here and I still haven't mentioned the missions or the game structure, but that's mostly because there's not a whole lot to talk about. 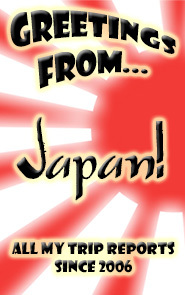 Most of the missions are lifted straight out of past games in the series, and involve infiltrating a hideout, either killing a specific bad guy or stealing a particular item, then escaping. Some missions are longer and more complex than others, but I'd say a good 80% of them follow that same pattern. Go in, shoot some people, get out, collect your reward. (I will say that I'm about 50% done with the game, but I doubt I'm going to see all that much in the remaining 50% that I didn't see in the first 50%.) A lot of them are pretty cheap, too, with artificial triggers for various events that don't feel natural at all. Pick up a bag of money and instantly you've got 4 stars and SWAT teams after you. WTF? I will say the cover system seems to work better than in previous games, and the aiming is improved as well, so the missions are more fun than they used to be. But they're basically structured the same as always. Last thing - multiplayer! I confess I'm not a huge fan of multiplayer in general (too many 12 year old morons), and I've been so dedicated to the single-player campaign that I've only really tested out some of the multiplayer modes. Deathmatch is fun, though obviously it's a pretty known quantity. (The addition of cars does add a new element to a pretty basic game mode, though - nothing like thinking you've got an enemy lined up in your sights only to suddenly go flying through another guy's windshield!) The other modes frankly have either not worked any time I've tried them or have been so under-populated that the few people who do join a game quickly leave. It's weird - I don't think GTA is fated to be a multiplayer game. Either that, or everybody's still stuck on the campaign. I'll keep trying, though. 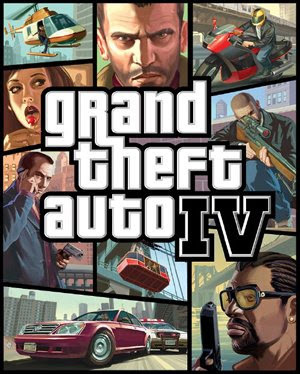 I'm glad GTA4 is popular - it deserves it - and I'm glad to see Rockstar Games and Rockstar North get credit for it. It's a great game, despite its flaws. It's huge, and for every negative there are ten positives. If it seems like I'm focusing more on the negatives here, that's just because nobody else really has, at least not in the gaming media. It's just not the complete game-changer that GTA3 was, and it's not as creative and just plain fun as Vice City - still the pinnacle of the series of you ask me. It plays like GTA3 with some refinements and additions, but still most of the same annoyances (and a few new ones). It's not perfect, but still, it's not like anybody's going to put out a better sandbox game any time soon. My Bloody Valentine US Tour! oh my god oh my god oh my god oh my god! Well, my day is shot. 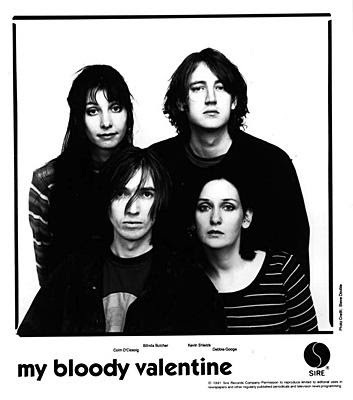 The recently-reformed My Bloody Valentine just announced a bunch of US tour dates. I won't be able to concentrate on anything else. For anyone who's not familiar, MBV is the original "shoegazer" band (the term was coined for them), but they're really more of an art-rock noise thing, although their last album, 1992's Loveless, is both pretty melodic and an outright classic. They never really broke up, either - they just haven't bothered doing anything together in about the last 16 years. I previously posted a couple of their videos in my Jazzmaster post - but here's another one. Its subject matter makes it pretty apt. "Come back again... to here knows when..."
This band changed my entire perception of music. Really, they changed my life. I'm working on some lengthy impressions of Rockstar's magnum opus Grand Theft Auto IV - hell, I might even call it a review. Hence the lack of updates here over the past week or two. Hopefully it'll be worth the wait. Check back in a couple days.